Youth homelessness is an escalating concern nationwide. 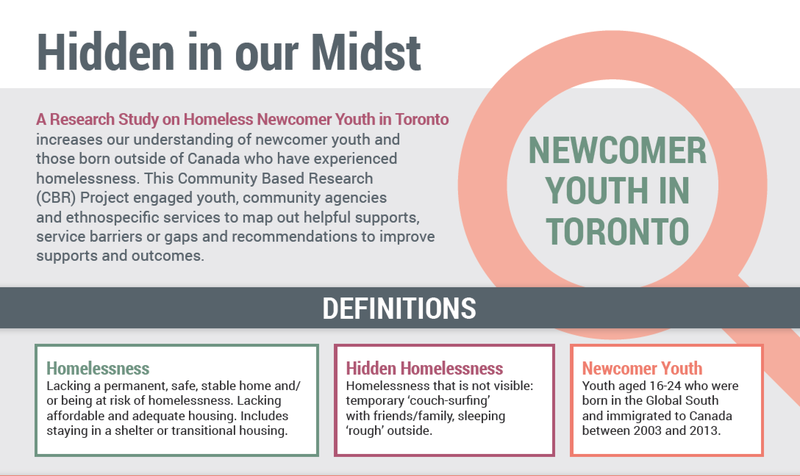 The Hidden in Our Midst Community Based Research (CBR) project, a joint project between Children’s Aid Society of Toronto and the Centre for Addictions and Mental Health (CAMH), brings our attention to newcomer youth and those born outside of Canada who have experienced homelessness. The results highlight unique barriers to access and service needs of newcomer youth. Key messages include: Newcomer youth feel marginalized in the service system – navigating it often feels like finding their way through a complex, confusing maze. This leads them to fall through the cracks; Newcomer youth want a seat at the table – in other words, they want to be meaningfully engaged in decision-making regarding service design; To make decisions that serve newcomer youth, they should be hired at all levels in the system to help design, implement and run service programming. Read the Final Report and Infographic and help share this important story. Youth need to be meaningfully engaged in decision making to help design, implement and run service programming. Link to the report at CAMH.